Matthews caught four of five targets for a team-high 93 yards in Sunday's 24-18 win over the Jaguars in London. 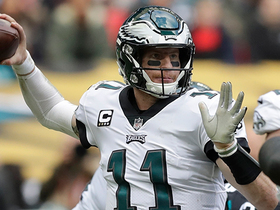 Analysis: Quarterback Carson Wentz spread the ball around to nine different targets, with no player catching more than four passes. 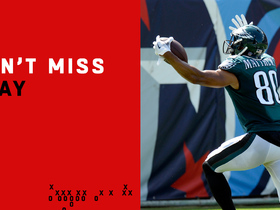 Matthews was his most effective receiver, though, nearly doubling Nelson Agholor's second-ranked output of 49 receiving yards. Since Matthews hadn't recorded more than two catches in a game this season prior to this outing, he'll be a risky option coming out of Philadelphia's Week 9 bye. Matthews played 29 of 67 snaps in Sunday's 21-17 loss to Carolina but did not see a single pass attempt thrown his way. Analysis: Matthews saw his typical workload as he now been on the field for between 22 and 33 snaps in four out of the five games he's appeared in this season. In that time, the 26-year-old has yet to see more than three targets in a game and has only surpassed 26 yards once. 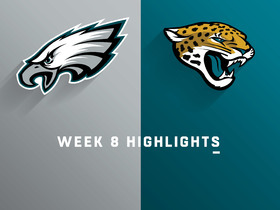 Things likely won't get any easier in London against Jacksonville in Week 8. Matthews caught two of three targets in Thursday's 34-13 win over the Giants. 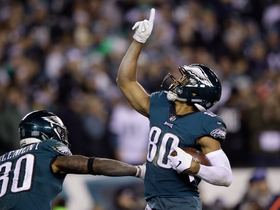 Analysis: The five-year pro saw the third-most snaps among Eagles' receivers and the three targets tied his season high. Zach Ertz, Alshon Jeffery and Nelson Agholor dominated Carson Wentz's attention as usual, and the trio will continue to do so as long as all members are healthy, leaving Matthews only a minimal role in the offense. Matthews caught his lone target for four yards in Sunday's 23-21 loss to the Vikings. Analysis: A week after catching a 56-yard touchdown and playing 47 snaps, Matthews was on the field for just 22 plays Sunday. The 26-year-old remains buried on the Eagles' receiving depth chart as seven other pass catchers saw as many or more targets than he did. He'll try for more Week 6 against the Giants. Matthews played 60 percent of the snaps on offense in Sunday's 26-23 loss to Tennessee, catching one pass for a 56-yard touchdown on three targets. 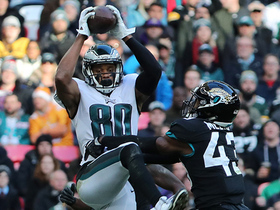 Analysis: Alshon Jeffery's return seemed to hint at a reduction in playing time, but the Eagles instead chose to remove Kamar Aiken (nine snaps) from the offense while leaving Matthews as the No. 3 wide receiver. Given what he did with his lone reception, we can expect to see a similar alignment Week 5 against Minnesota. Matthews still doesn't have the easiest path to targets, as Jeffery, Nelson Agholor and Zach Ertz figure to dominate Carson Wentz's attention. Matthews (hamstring) has been removed from the final injury report for Sunday's game in Tennessee. Analysis: An early report had Matthews listed as questionable, but it turns out the Eagles have cleared him to play. He may slide back to a minimal role after serving as the No. 3 wideout last week, as the Eagles seem to expect Alshon Jeffery (illness, shoulder) to make his long-awaited 2018 debut. Matthews (hamstring) is listed as questionable for Sunday's game in Tennessee, Jimmy Kempski of PhillyVoice.com reports. Analysis: Matthews caught two passes for 21 yards in his return to the Eagles last week, but he may have aggravated the hamstring injury that contributed to New England's decision to release him back in August. Whatever the case, Matthews may drop down to No. 4 on the depth chart even if he ends up playing, as the Eagles hope to have Alshon Jeffery (shoulder, illness) available for the first time this season. Matthews was listed as a limited participant at Thursday's practice due to a hamstring injury. Matthews played 33 of 82 snaps (40 percent) on offense in a 20-16 win over the Colts on Sunday, Daniel Gallen of PennLive.com reports. 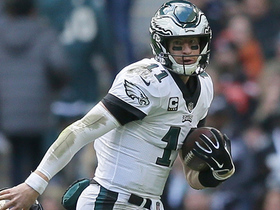 The Eagles signed Matthews to a contract Wednesday, Jordan Schultz of Yahoo Sports reports. 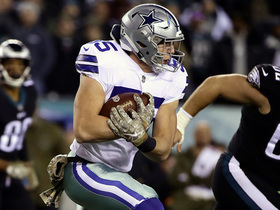 Matthews met with the Eagles on Tuesday to discuss the possibility of returning to Philadelphia, Tim McManus of ESPN.com reports. With the Patriots' wideout corps thinning out depth-wise, Matthews (hamstring) could end up being re-considered by the team down the road, NFL Network's Michael Giardi reports. Analysis: A hamstring injury that Matthews suffered early in training camp led to his release, but the report suggests that the Patriots could take another look at Matthews, who remains unsigned, once he's healthy. With that in mind, Matthews doesn't appear to be an option out of the gate this season, but he could potentially resurface in October, if not sooner. The Patriots have released Matthews (hamstring) from IR with an injury settlement, Field Yates of ESPN reports. Analysis: As a result, the veteran wideout is a free agent and can look to catch on elsewhere once his hamstring is fully healed up. When that might be remains unclear, as earlier this week Matthews' injury was portrayed as significant. Updating a previous report, the Patriots placed Matthews (hamstring) on injured reserve Wednesday, according to Field Yates of ESPN. Analysis: Initial reports suggested that Matthews would be released by the Patriots in the wake of suffering a troublesome hamstring injury. Instead, the wideout will reside on IR for now, though down the road he could negotiate an injury settlement with the team and become a free agent. The Patriots released Matthews (hamstring) on Wednesday, Jim McBride of The Boston Globe reports. The hamstring issue that Matthews has dealt with of late is "deemed to be significant," Ian Rapoport of NFL Network reports. Analysis: Though no timetable for Matthews' return has been outlined, the wording of the report suggests that this situation could be more of a week-to-week than a day-to-day one. The Patriots have already kicked the tires on veteran wideout Eric Decker, and it wouldn't be surprising if he or another free agent was added to the mix with Julian Edelman (suspension) slated to miss the first four games of the regular season. Matthews (hamstring) isn't participating at Wednesday's practice, Nora Princiotti of The Boston Globe reports. Matthews, who exited Sunday's practice early, is dealing with a right hamstring injury, The Boston Globe reports. Analysis: Matthews pulled up after running a deep route downfield and subsequently made an early departure for the locker room. The severity of his injury still isn't clear, but a hamstring injury is particularly worrisome in the sense that they tend to linger. With Kenny Britt (hamstring) and Malcolm Mitchell (knee) also injured, Phillip Dorsett and Cordarrelle Patterson could see extended reps with the first-team offense this week. Matthews left Sunday's practice early with an undisclosed injury, Mike Reiss of ESPN.com reports. Analysis: Matthews appeared to tighten up during Sunday's session and exited the field for the remainder of the day. While the injury doesn't appear serious, Phillip Dorsett and Cordarrelle Patterson could benefit from some extra reps as long as Matthews is sidelined. Matthews (knee) performed 11-on-11 work at the Patriots' mandatory minicamp earlier this month, Kevin Duffy of MassLive.com reports. Matthews (knee) only received $170,000 guaranteed in his one-year, $1 million contract with the Patriots, though he can earn another $700,000 in incentives, Albert Breer of TheMMQB.com reports. Matthews (knee) is signing with the Patriots on a one-year deal, Adam Schefter of ESPN reports. 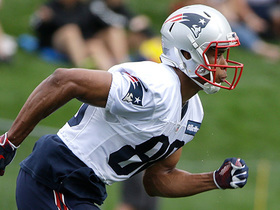 Analysis: Matthews visited New England earlier in the week. After the Patriots traded Brandin Cooks to the Rams on Tuesday, the subsequent move was to fill the gap with Matthews, who is coming off of a career-worst year with the Bills. The fifth-year receiver should have a much more fruitful season in New England if he can stay on the field, as he missed a total of 10 games in 2017 with a combination of thumb, knee and ankle injuries. Matthews (knee) has scheduled a visit with the Titans, Adam Schefter of ESPN reports. Matthews (knee/ankle) reportedly visited the Patriots on Monday, according to the Buffalo News. Analysis: The 2014 second-rounder saw his production dip to 25 catches for 282 yards and a TD in 10 games with the Bills last season, but Matthews did put up some PPR-friendly numbers during his three-year stint with the Eagles. 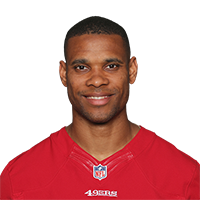 That he's still available this deep into free agency indicates the market for the 25-year-old wideout isn't sizzling on the heels of a 2017 campaign marred by ankle and knee issues. Matthews previously visited the Cardinals and Packers. Matthews (knee) will visit the Packers on Friday, Tom Silverstein of the Milwaukee Journal Sentinel reports. Matthews (knee/ankle) paid a visit to the Cardinals on Friday, Mike Jurecki of Arizona Sports 98.7 FM reports. Matthews (knee, ankle) said Tuesday he isn't certain that he'll re-sign with the Bills, acknowledging that the team likely will want to monitor his rehab from a pair of December surgeries before making any offers, Mike Rodak of ESPN.com reports. Matthews confirmed Thursday that he underwent surgery on his left knee and right ankle, Chris Brown of the Bills' official site reports. Analysis: Matthews revealed the news on his personal Twitter account, posting a photo of his left knee in a heavy brace and his right ankle in a boot. It's unclear how lengthy of a recovery timeline Matthews will face for either injury, but neither surgery is expected to delay his start to the 2018 campaign. Matthews will head into free agency for the first time in his career after a disappointing, injury-plagued season with the Bills. 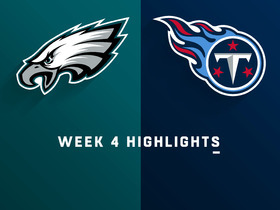 Matthews (knee), who was placed on injured reserve Tuesday, may require surgery, Mike Rodak of ESPN.com. "We'll see," Bills head coach Sean McDermott said Wednesday, when asked if Matthews would need to go under the knife. Matthews (knee) has been placed on injured reserve by the Bills. Analysis: The 25-year-old wideout thus finishes the 2017 campaign with a career-low 25 catches for 282 yards and a touchdown through 10 games. With Matthews -- who is eligible to become an unrestricted free agent after the current season -- no longer in the mix, the Bills will need to rely more on the likes of fellow wideouts Zay Jones, Deonte Thompson and Kelvin Benjamin (knee) -- health permitting -- down the stretch. Matthews (knee) brought in one of three targets for 14 yards in Sunday's 23-3 loss to the Patriots. Matthews (knee) is listed as active for Sunday's game against the Patriots. Analysis: Matthews will be out there if you need him, but working in an attack that has endured ongoing struggles in the passing game thus far, he's a Week 13 fantasy dart, even with Kelvin Benjamin (knee) sidelined. Matthews has only logged one outing with more than three catches all season and is coming off a two-catch, 15-yard effort (on three targets) in Week 12's win over the Chiefs. Matthews (knee) was limited for the third straight practice Friday and is listed as questionable for Sunday's game against the Patriots. Analysis: Matthews played under the same designation last week against the Chiefs, so he doesn't seem to be in much peril for the critical divisional showdown. His effectiveness is another story, though, as Matthews is still obviously bothered by the knee issue and has only had one game with more than three catches all season. Matthews (knee) was limited for the second straight practice Thursday. Analysis: Matthews was limited all last week and still played in the upset win over the Chiefs, but his numbers -- two catches for 15 yards -- and continued limited practice schedule suggests he's playing through pain. Reliable as Matthews was in his three Eagles seasons, Buffalo is an offense that struggles to consistently pass the ball well, leaving him as a dart for fantasy and DFS play. Matthews (knee) will practice in a limited capacity Wednesday, Mike Rodak of ESPN.com reports. Matthews (knee) turned three targets into two catches for 15 yards in Sunday's 16-10 win over the Chiefs. Analysis: Matthews didn't make much of an impact in his return to the lineup, as fellow wide receiver Zay Jones was the one to take advantage of Kelvin Benjamin's (knee) absence with an 11-yard touchdown. The former Eagles wide receiver is averaging fewer than 30 yards per game and only has one touchdown in nine appearances for his new club, so Matthews hasn't had much value in any format this season. Matthews (knee) is listed as active for Sunday's game against the Chiefs. Analysis: Matthews' return to action Sunday gains added import, with fellow wideout Kelvin Benjamin (knee) inactive. Zay Jones and Deonte Thompson (ankle) should also factor in, but all three represent Week 12 fantasy darts, considering the state of the Bills' passing attack. Matthews (knee) is expected to play Sunday against the Chiefs, a source informed Adam Schefter of ESPN. Analysis: Matthews was limited in practice all week and listed as questionable on the Bills' final injury report, but it looks like he's set to return from a one-game absence. With no more than 61 receiving yards in any of his eight appearances this season and one touchdown on his ledger, Matthews probably won't make for a strong option in most formats, but his availability is huge for Buffalo nonetheless with fellow starting wideout Kelvin Benjamin (knee) already ruled out. Matthews (knee) is listed as questionable for Sunday's game against the Chiefs after practicing all week. Matthews (knee) remained limited at Thursday's practice. Analysis: More on Matthews' status Friday, but his continued practice participation, albeit in a limited capacity, bodes well for his chances of returning to action Sunday against the Chiefs. His Week 12 status gains added import, with fellow wideout Kelvin Benjamin (knee) not having practiced yet this week. Matthews (knee) was limited at Wednesday's practice. Analysis: Matthews was a limited practice participant all last week and a game-time decision for Sunday's eventual 54-24 loss to the Chargers. He ultimately was held out, but the fact he nearly played suggests he's trending in the right direction for the Week 12 matchup in Kansas City, where the Bills may be without Kelvin Benjamin (knee). A full practice by the end of the week wound inspire confidence that Matthews is ready to play. Matthews (knee) is inactive for Sunday's game against the Chargers, Chris Brown of the Bills' official site reports. Analysis: Matthews practiced to some degree most of the week, so this is a bit of a surprise. Since the Bills' passing attack has been inconsistent all season and will now deploy rookie quarterback Nathan Peterman at quarterback, perhaps the absence takes some of the guesswork out of things for Matthews owners. Matthews will test his injured knee before Sunday's game against the Chargers, according to ESPN's Adam Schefter. Analysis: Matthews is officially listed as questionable, and while head coach Sean McDermott is optimistic Matthews will play, according to NFL Network's Ian Rapoport, it'll all come down to how his knee reacts to the pregame work. If he is good to go, he'll also have to deal with adjusting to new quarterback Nathan Peterman. Matthews (knee) is listed as questionable for Sunday's game against the Chargers. Analysis: Matthews was a limited participant in practice Friday, which had also been the case in the Bills' other two sessions earlier in the week. Since Matthews wasn't absent for any practices, it's generally expected that he'll play Sunday, but his fantasy upside will remain fairly limited with the Bills breaking in a new starting quarterback in rookie Nathan Peterman for the Week 11 matchup. Matthews (knee) was a limited participant at Thursday's practice. Bills head coach Sean McDermott said Matthews would be a limited participant at Wednesday's practice due to a knee injury, Chris Brown of the Bills' official site reports. Matthews caught just one of two targets for 14 yards during Sunday's blowout loss to the Saints. Matthews brought in six of eight targets for 46 yards in Thursday's 34-21 loss to the Jets. He also lost a fumble. Matthews' new teammate Kelvin Benjamin, acquired in a trade with the Panthers on Tuesday, will not make his team debut Thursday against the Jets, Adam Schefter of ESPN reports via a source. Analysis: The decision might actually affect Buffalo's lesser receivers more, as Matthews is still a firm No. 2 even when Benjamin gets up to speed. In any matter, he'll receive a full complement of looks Thursday from Tyrod Taylor, though we'll at least note Matthews is still looking for his first game as a Bill with more than three catches or more than 61 yards.